Gaming phones are the latest niche in the smartphone industry. The Razer Phone started it in November 2017, and since then, we have seen Xiaomi and Asus join the bandwagon by launching the Xiaomi Black Shark and the Asus ROG Phone respectively. Personally, I think gaming-focused phones make too many compromises with aesthetics, and the limited availability of these phones also makes them a hard sell. It can be noted that the Qualcomm Snapdragon 845 chipset technically makes many flagship phones gaming phones. Either way, it seems Xiaomi’s Black Shark subsidiary is gearing up to launch another gaming smartphone, which may quite possibly be the Black Shark 2. 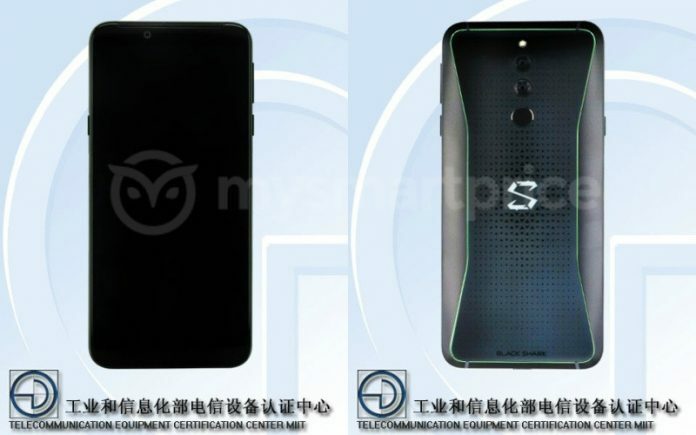 The upcoming Black Shark smartphone has been listed on TENAA with the model number SKR-A0. The first-generation Black Shark phone has the SKR-A0 model number, signifying their relation. The TENAA listing also has images of the device, which show a few differences when compared to its predecessor. The first-generation Black Shark’s dual rear cameras were placed horizontally on the back, while the upcoming phone places them vertically on the center. The fingerprint sensor is placed below the dual camera module, and the aesthetics are a bit off to say the least. This is another point of difference as the first-generation Black Shark featured a front-mounted fingerprint sensor. According to the TENAA listing, the Black Shark 2 will feature a 5.99-inch display and have a 4,000mAh battery (just like its predecessor). The rest of the specifications such as the SoC, RAM and storage configurations weren’t specified. It’s likely that the phone will be powered by the Snapdragon 845 again, and RAM options can be expected to reach up to 8GB. The phone’s dimensions are 160 x 75.26 x 8.7 mm. In terms of pricing, the first-generation Black Shark phone was priced at CNY 2,999 for the 6GB RAM variant and at CNY 3,499 for the 8GB RAM variant. The Black Shark 2 will likely have similar pricing, but we don’t know if it will be available internationally. For reference, the Black Shark was restricted to China-only sales. According to the TENAA listing, the upcoming Black Shark phone may launch in the fourth quarter of this year.